In 1954, the old store was replaced by a new one 60 x 115. More groceries and a full drygoods department was added. later a meat department was opened. In 1960, the store was again renovated and a complete new front was added. Again more room was needed and in the late fall of 1971 an extra 35 x 115 feet addition brought the store to its present size. A new service station was opened in 1960 replacing the original one which had served its time. In September of 1946, Ken Hall resigned and Glen Shell born was hired as manager. Roy Shellborn had served on the Co-op board but asked to be replaced when his son was going to be the manager. Glen Shell born managed the store from 1946 until August, 1978. He had seen many changes as the Co-op grew and expanded. Upon Glen Shellborn's resignation Fred Konkin was hired as manager. He was with the Erickson Co-op for a year and then the present manager, Larry Squance assumed the roll of manager. As the years have passed the Co-op has continued to grow from a very modest beginning until today when the volume is close to three million dollars. Much could be written about the hardships, struggles, happy times, problems and success that the Co-op has endured. With capable guidance the Co-op can grow and prosper even in the tough economical time we have at the present time. It would be heartbreaking to the early pioneers if "their" Co-op should become a memory as other Co-operatives have done the last few years. As we look at the Co-op Store in our town let us be reminded that it is a concrete symbol of the faith of the pioneers in the co-operative movement in the district. They believed and worked "one for all, and all for one." Lake Lands Creamery built in 1935. He chose a sight to build a creamery, just West of the latter C.N. Station below the tracks. Andrew had a building erected, imported a stationary steam engine from the United States for power, hired Mr. J. Miller as Manager, and the creamery was in operation by July, 1909. From 1911 to 1918, the Creamery operation ceased and was changed to a productive grain crushing plant and shingle mill. 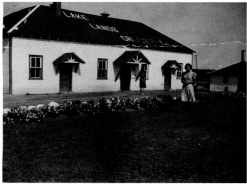 In 1918 Anton and Sofus Christianson purchased the plant and again operated a creamery until 1934, when Anton purchased the Creamery at Minnedosa where the equipment was moved. This creamery was never re-opened. Ken McKay hauling buttermilk/rom the Creamery. 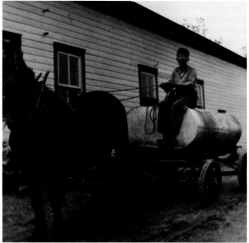 In April, 1935, Newman Hall Sr., his wife Mary, son Kenneth and his wife Elizabeth "Betty", son-in-law Dawson MacKay and wife Ruth, Peter Bruce, a future son-in-law moved to the village of Erickson from Rapid City, Manitoba. Their purpose in coming to Erickson was to construct and operate a Creamery. On May 1, 1935, construction began and Lake Lands Creamery was in operation by July 1, 1935 under the management of Dawson MacKay. The Hall's family all contributed to the business, each having a job such as bookkeeping, grading eggs, and butter making. On a busy day three hundred cans of cream was brought in. In 1939, the business was sold to Mr. Fatheringham of Brandon who changed the name to Brandon Creamery and Supply. In 1943, it was sold to Manitoba Dairy and Poultry Co-op under the management of Peter Bruce, until 1946 when Jim Lasiuk was Manager, later by Ernest Collins and then George Scott until closing in 1974.